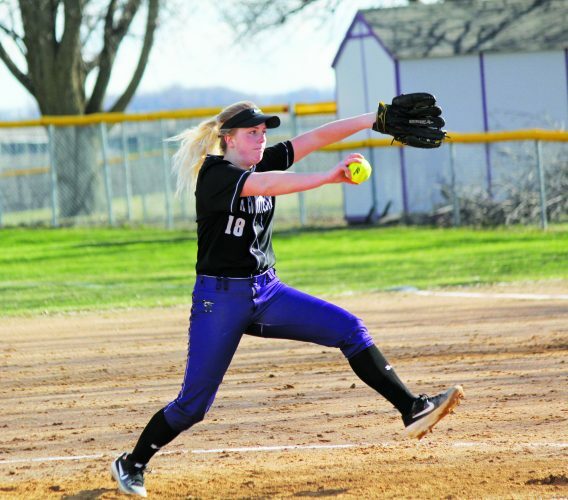 MOORHEAD – The Southwest Minnesota State softball team (13-17, 8-10 NSIC) broke a 10-game losing streak with a 7-0 shutout victory over MSU Moorhead (11-24, 5-13 NSIC) in game one and a 12-1 victory in five innings, aided by two grand slams in game two, in a Northern Sun Intercollegiate Conference doubleheader on Monday afternoon at Scheels Field at Nemzek Stadium. SMSU opened conference play with an undefeated six-game streak before facing nationally-ranked Augustana and Winona State back-to-back. Monday’s sweep was the first sweep for the Mustangs since they swept Minnesota Crookston in Marshall on April 1. The Mustangs started the game with hot hitting to drive in four runs. Bailey Johnson drove in the first run with an RBI single to left center to score Abbie Decker. With runners on first and second, Alex Reak hit a three-run home run to score Johnson and Kali Tomlinson to finish off the first inning. Sara DeSmet continued the home run action advancing the lead to 5-0 in the bottom of the fifth with her first collegiate home run. For the third and final home run of the game, Johnson sent the ball over the fence for a bring in the final two runs of the 7-0 shutout. Athena Golling (8-8) tossed all seven innings with six strikeouts. Four Mustangs tied for a team-high two hits. The Dragons went to go on the board for an early lead after a solo homer from MSUM’s Emma Dummer in the top of the first would put them up one run. The Mustangs took the game back in the bottom of the second as Reak started the inning out with a single to centerfield. Kristin Neumann came in to pinch run for Reak and was brought in by a fielding error on the Dragons. With bases loaded, Kaylee Hentges walked as Van Regenmorter came in to earn a 2-1 lead after two complete. SMSU’s hot-hitting returned from the first game in the fourth inning as Tomlinson drove the ball over centerfield for a grand slam to advance SMSU’s lead to 6-1. In the fifth inning, the Mustangs loaded the bases with two outs as Johnson walked to bring in DeSmet followed by another walk to bring Madysson Schliinz home. The Dragons attempted to end the inning by putting the game one starting pitcher, Becky Berth, in the circle, but Reak stepped to the plate to hit the second grand slam and end the game with a 12-1 final. Shelby Crank earned the victory in the circle not allowing a run and not walking a batter. Southwest Minnesota State returns to action today at Wayne State (10-25, 1-17) for a 2 and 4 p.m. doubleheader.